When Winslet was born she was so tiny. There is no way to convey just how small and fragile she was. I have searched through every photo I own to find a few, or even just one, that really puts her in perspective but I have nothing. Maybe I never will be able to separate what a 25 week fetus at 2 lb., 12.5 in. is in real life, from what it is to a new mother flooded with fear and grief, devastated by such a cruel beginning. I wasn't ready to let her go even though my body did, and I wasn't ready to share her just because she had been born. I needed to protect her still, if not by my physical body then in some small way because we were both profoundly vulnerable. Burdened beneath a respirator, umbilical lines, monitor wires, and tape, she incubated seven miles away from me, six floors up in a high security ICU. At her bedside she was gifted unflinching nurses who, for the first three weeks of her life and 24-hours a day, orchestrated her bodily systems in real-time like physiological magicians. The omnipresent tension of life and death in the NICU is harrowing and it wanted to kill me. The only salve to my anguish was to be with her. I centered her, pouring myself into every moment I could steal away from my "other life," the place outside hospital walls where my two boys and my marriage lived. She and I were supposed to be connected still, and my body yearned for hers. Our separation was unbearable for me, a physical pain. But there were moments of peace too. In my wandering between worlds, it seemed that everyone outside the NICU wanted to celebrate at a time when our lives were so fraught. I knew we would have to endure the worst of it before we could answer the deep-rooted question that I had carried in my heart from the beginning: what would her quality of life be like if she lived? Nothing was certain. I wanted to celebrate my daughter but our reality in those early weeks was crushing. In spite of years of hesitation after Merritt’s early birth at 33 weeks, my desire for another baby had compelled me to risk the possibility of another NICU stay—though I'd never considered risk of life of future babies. My pregnancy with Winslet had been difficult from the start, with a heartbreaking trajectory. A complete loss of control for me and a realization of my deepest fears, the future unknown, but I could choose to hold close our most heart wrenching and tender moments together. In her first days and weeks I didn’t share many photos of Winslet publicly or privately. I’ve since wondered if the way I saw her then—first impressions, lasting impressions—would be the only way I could ever see her. Fragile. Sick. Suffering. Now when I look through the hundreds of images from Winter 2016, emotion still catches me in the throat, but it’s because we’ve since lived the story that came after and I know now that she is safe and thriving. It is hard to imagine that my sturdy, tenacious girl, bright with curiosity and fearless to her core was once ever so tiny and fragile. I look at her photos and study her features, her expressions—all the same then as now. I look at the photos and I recognize Winslet as my little girl then as now but my fear is gone, grief subsiding. Devastation clearing way for new growth and dreams fulfilled. Our home is the closest it's ever been to being finished but there is still so much to do—all installation of interior hard finishes like lighting, flooring, cabinets, built-ins, fixtures, and countertops. The deck is halfway installed and bathroom tile work has begun. When we chose white as the backdrop color for our modern space, I had no idea how complicated the color white can be. I may have overthought this step, but after hours (and hours) of research and indecision we finally settled on Chantilly Lace by Benjamin Moore for every room and all trim, with exception for the kitchen. Chantilly Lace is a true neutral white, not too blue and not too yellow, which will work well with the cool toned vibe in the bathrooms, as well as with the warm wood furniture that we already own and tend to gravitate toward in living spaces. The kitchen cabinets we ordered were the whitest in the color line offered by Wolf at the time (though they've since added a whiter white) but it is still warm in comparison and would probably come off as dingy if we kept Chantilly Lace as the wall color there, so we matched the wall paint to the cabinets to ensure that the whole space reads as white. 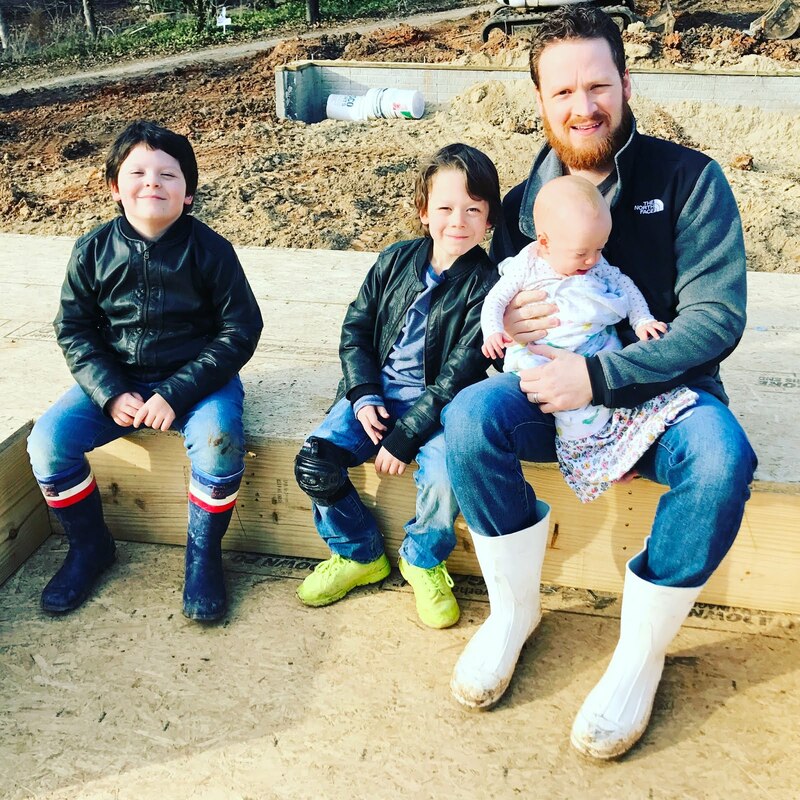 As we near the final push Andy is more hands on and has been spending as much time as he can at the house, taking time off work and on the weekends to complete projects like sound proofing, electrical wiring, insulating the crawl space, and building the deck. He stained the floor of the guest bunks last weekend and will be laying the wood floors throughout the house soon. The house takes up a lot of our mental space right now and the last four weeks have required a steady and near daily effort to chip away at final decisions to purchase the doors, doorknobs, light fixtures, and accessories for our outdoor space on the deck. 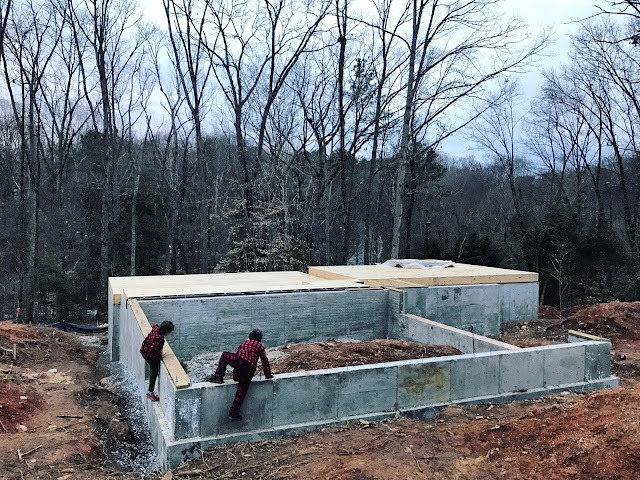 We are figuring out how to pull off the concrete floors and vanity in the communal bath, and we still need a wood source for the open shelves in the kitchen. The todo list feels near endless and requires constant tweaks to accommodate design and logistical issues that inevitably pop up, as well as take into account the constraints of the budget. Anticipation is high for a move sometime in October, but even that seems optimistic now. Packing continues slowly and I'm purging as I go, which feels good. 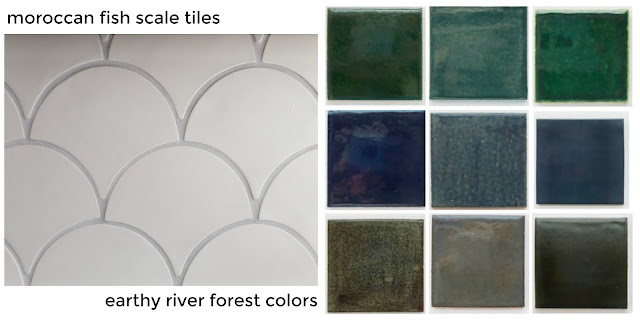 My Ode to the James backsplash tiles for the inset accent wall in the downstairs powder room arrived a few months ago and they are so pretty in person! 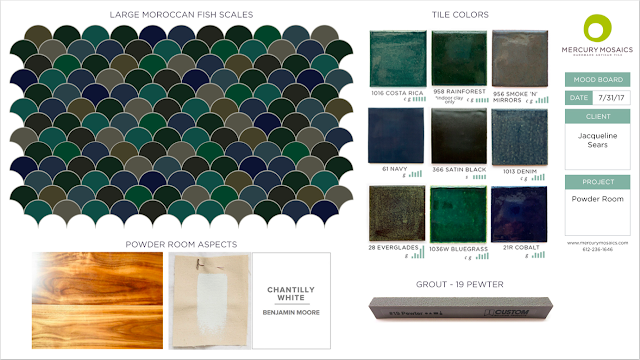 I checked in with the folks at Mercury Mosaics to inquire about grout color suggestions, because they are really good at design and, as usual, they made my life easy and went above and beyond to carefully create and share a mood board with their grout recommendation: pewter. Last week we taped off a 5' x 5'6" area then laid out and labeled the tiles to create a template for the mason. We started at 9:30pm and it only took 3 hours as we worked by the light of a rechargeable lamp that kept dying! I wouldn't recommend it, but I'm glad we got it done. We decided to go with the cozy and homey hillside up. I'm looking forward to seeing it go up on the wall next week! 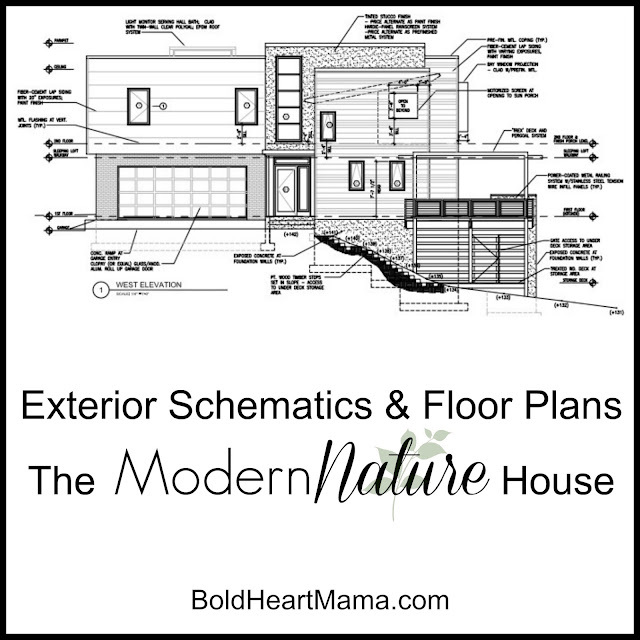 Modern isn't the word I would use to describe my decorating style, my fashion sense, or my favorite art, but motherhood has inspired a greater appreciation for order, simplicity, and minimalism—probably because babies and the early years of parenting bring a whole new level of unpredictability and chaos to daily life. Change is the only constant, as they say, and it's no wonder that we modern mothers crave a sense of control—the desire to regain order, to simplify our time and our belongings, and invest our limited resources in the good stuff of life that matters most. With that said we will soon have a home with modern architecture and I am thrilled for the ways that this artfully designed space will become our sanctuary for good, easy living. We already feel intimately connected to this house through the design process, and the trickier task of choosing interior finishes from endless possibilities, but the modern design resonates like a kindred spirit as we move into the next phase of living and of raising our family. Our intention for the interior design has been to strike balance between modern/industrial/nature without falling too hard for the latest trends, all while keeping our spaces warm and cozy with a classic vibe. It's been my challenge to make this unicorn concept come to life with only paper plans to work off. Making many decisions at once without being able to see how all the pieces will play off each other has made this process worrisome for me, but I believe that as long as the individual choices we make are in favor of what we truly love then the details will come together as a reflection of us and we will enjoy it for a long time. 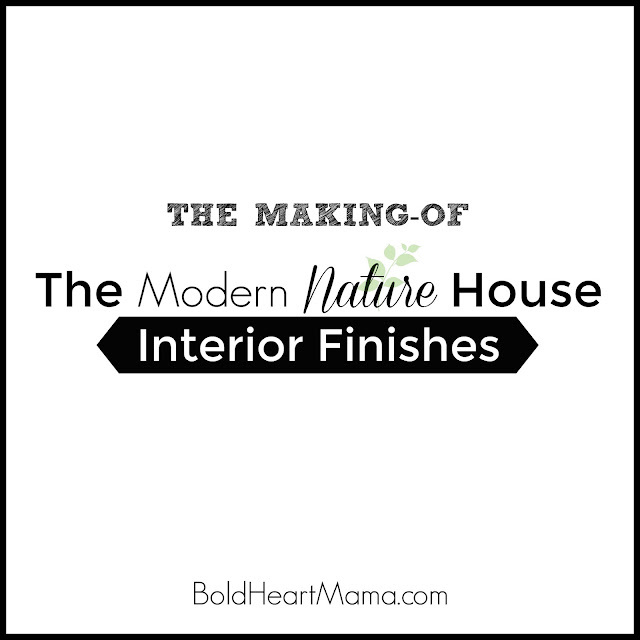 My strategy for choosing interior finishes has been to lean heavily on the architecture of the house, coupled with a few key choices we made to create a high contrast interior: all white walls, black window frames, and clean shaker panel doors. 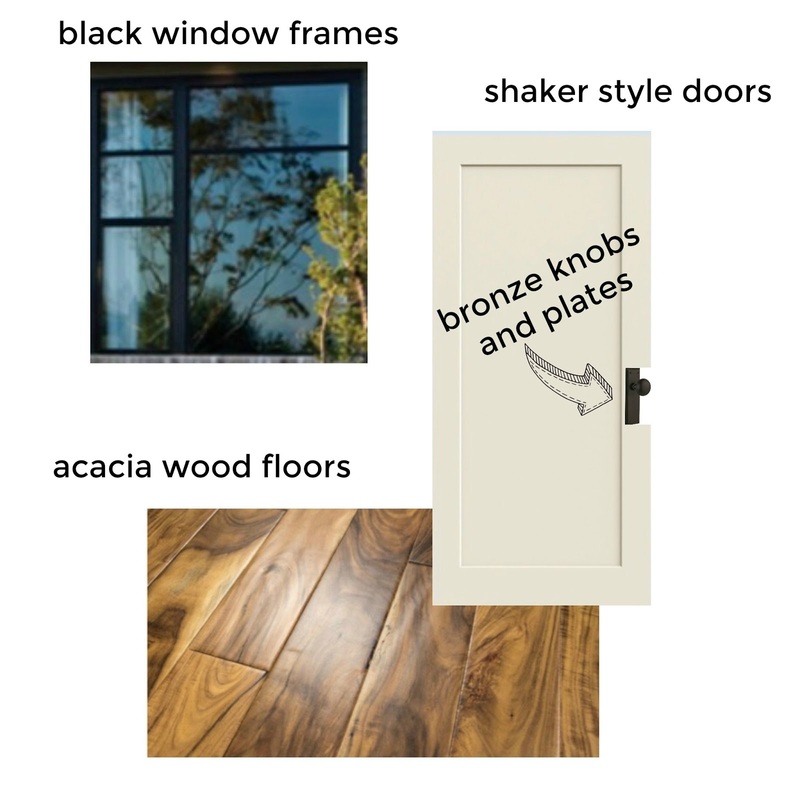 To warm up this modern shell we chose bronze hardware for the doors with a traditional knob and plate, and honey hued acacia wood in a varied size plank that will be installed throughout the first and second floors with the exception of the communal and master bathrooms. So far we have made final decisions on all flooring, cabinets, counters, tile, hardware, and plumbing, leaving only the main lighting fixtures and a few options for built in cabinetry. 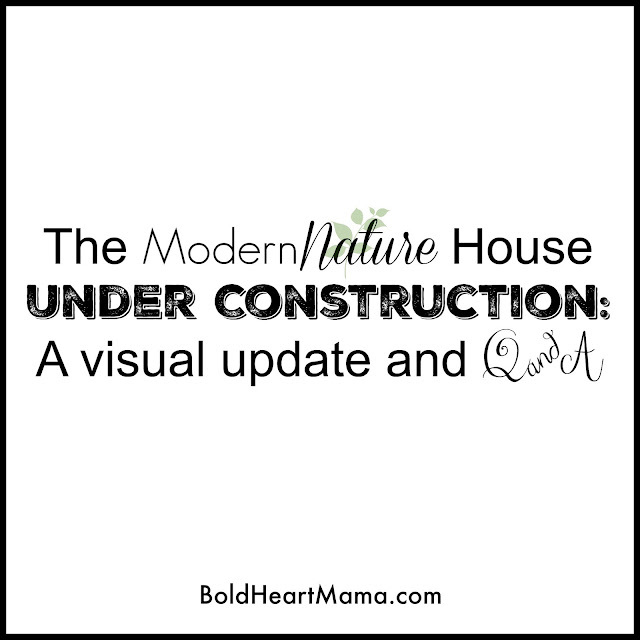 I'll look forward to doing a walk through when the house is complete, but in this post I'll share some of the big ideas from the kitchen, the master and communal bathrooms, and powder room. 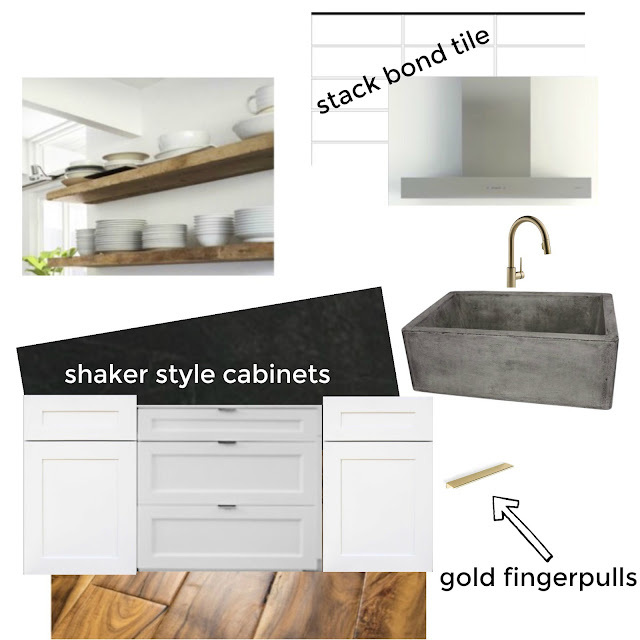 To achieve the high contrast, minimalist look that we like so much we chose white walls, white painted shaker-style, frameless cabinets, and dark soapstone counters with a soapstone farmhouse sink. We decided to take a little leap and go with brass finger pulls instead of knobs for the cabinets, a brass faucet, and wooden open shelves to complement the acacia flooring. 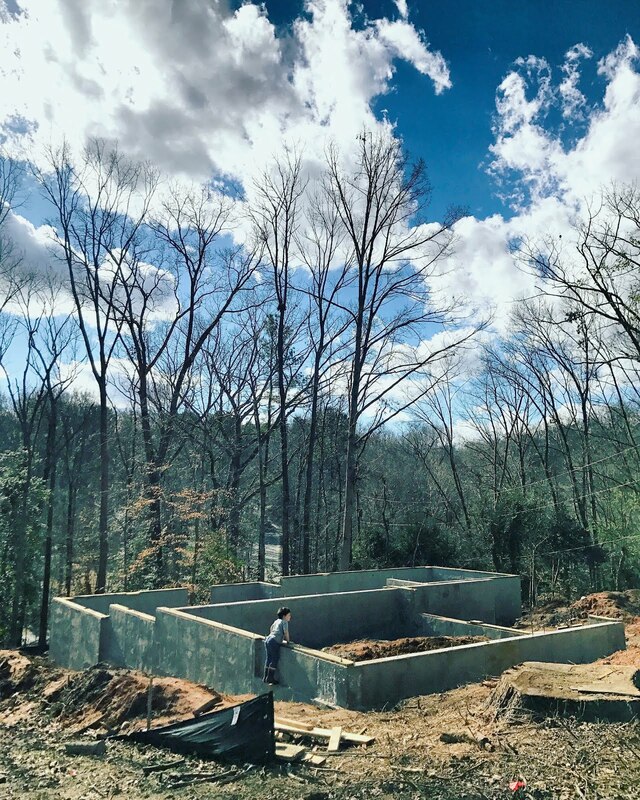 We will have stainless steel appliances, including a double oven and separate cooktop, and a streamlined range hood with a white stack bond tile behind it. I like the way that mixing finishes creates depth and adds interest. Faucet is Delta, Trinsic. In the master bathroom we wanted to create a refreshing, romantic, and serene space. We chose a large 12" x 24" gray ceramic tile with a subtle wood grain for the flooring, carerra marble counters with backsplash, and a wood inlay for the vanity area. 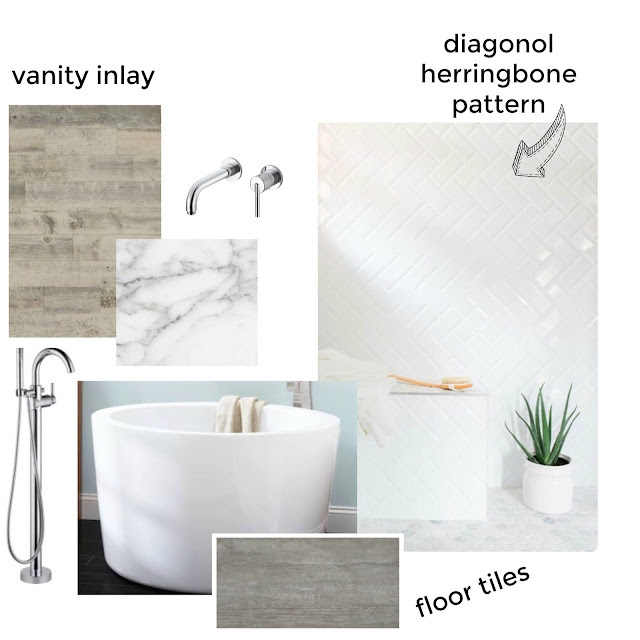 A freestanding japanese soaking tub will be sublime year round, and in the separate shower we went with 4" x 8" white beveled edge tiles in a diagonal herringbone. Faucets are Delta, Trinsic. The boys' bathroom is a communal area meant for all the kids to share, but it's near to the guest's bunkroom and intended for use by our family and friends when they stay over as well. 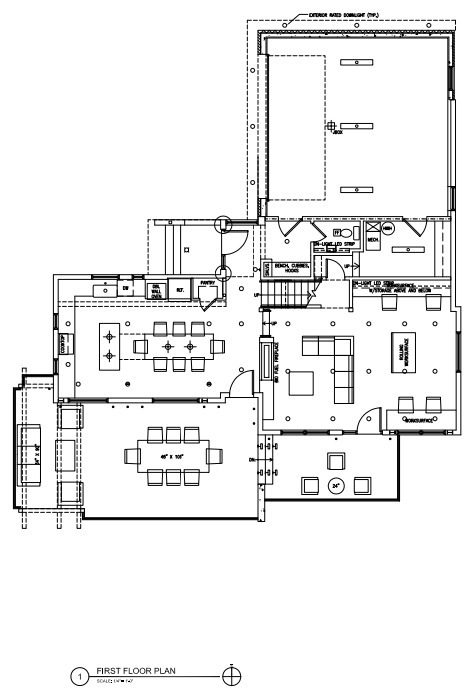 The communal bathroom has one common space with two separate but identical toilet and shower areas. This room will have concrete floors throughout, and a concrete countertop with open wooden shelves underneath. To keep the interior of the shower/wet zone bright and no frills we chose a 4" x 12" long bright white stack bond tile. Faucet is Brizo, Litze. One last little detail about our tiny powder room on the first floor is that we will be using moroccan fish scale tiles on the wall behind the sink. I want the bathroom to feel a little wild as an ode to our James River and so we chose this style tile in an earthy river forest palette. I haven't decided which direction I want the scales to point yet but I'm really excited about this little splurge. Are there any do it yourselfers out there tackling projects or making big house decisions, either renovating or building new? I would love to hear the process for how you came to your final decisions on interior materials. We walked through the first floor of the house over the weekend for the very first time. We've mostly been voyers from afar since framing began because we try to stay out of the way of the crew when they are working. On Saturday all was quiet so we climbed up the foundation wall in the garage, and into the entry to give ourselves a little tour of the space. We were there in late afternoon and I got all awestruck seeing how the final hours of daylight will stream brightly through the big windows in our kitchen. 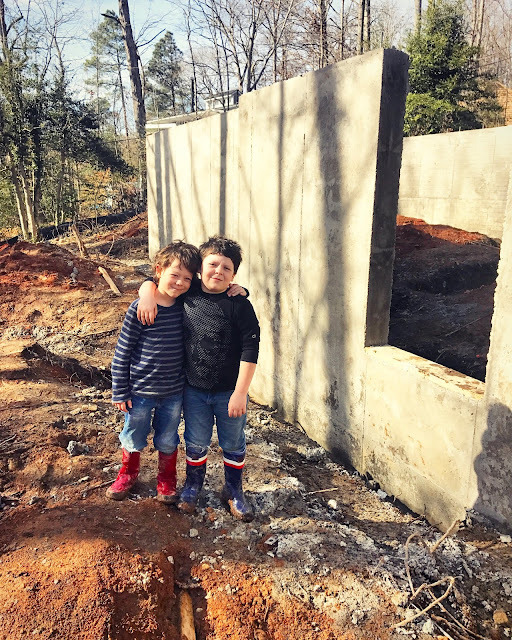 The boys quickly found their bearings with long pieces of rebar and began a play fight scene in the living room, while I did a walk-through to get a sense for each space. 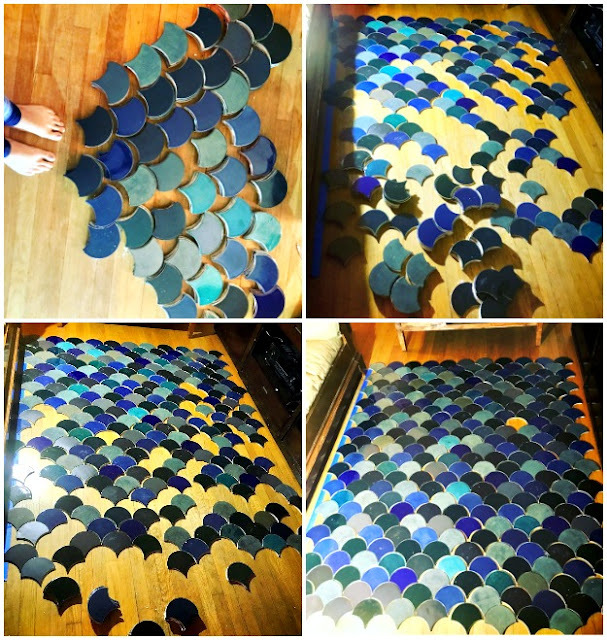 I've felt somewhat out of touch with the details since Winslet was born, so seeing it in person was helpful to my process as we are currently in various stages of choosing and purchasing all the finishing materials. It's wild to see this dream we've had on paper for all these years finally come into something tangible over the last month. If you are curious you can check out the latest and FINAL exterior schematics and floor plans, or catch up on the WHOLE story of the design process, plus a few of the hiccups we encountered along the way to finding land here in the archives. 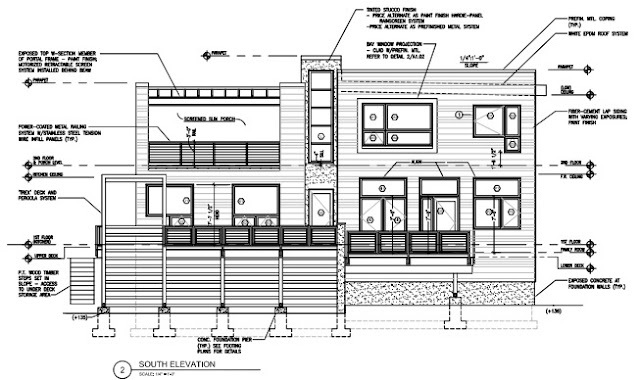 For now, here's a visual progression of the construction process so far. Raw land after some clearing of the woods. Excavation, footing pour with rebar: COMPLETE! 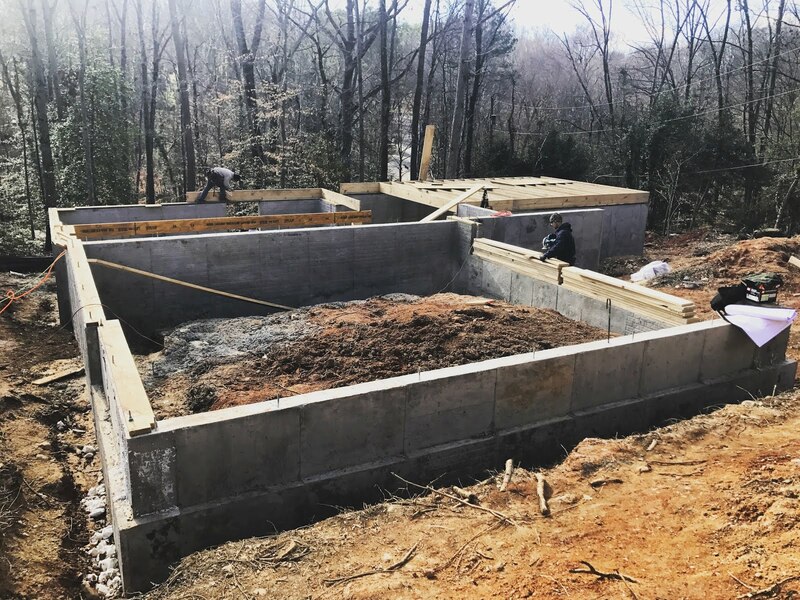 Foundation forms built and walls poured. After stripping the forms the foundation walls are ready! Checking it out, and taking it all in. Deck of first floor in progress. Over the edge they go! Deck is almost done. Deck and site work (moving all the dirt to where it needs to go) complete! Another view of the kitchen from a different angle. 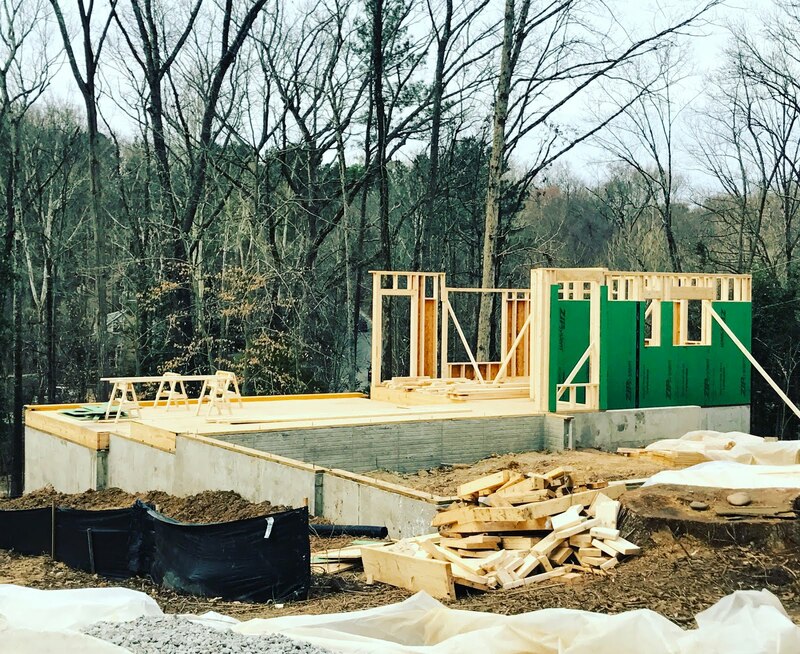 The first floor framing will be complete soon, and the second story deck and framing will wrap up by the end of the month. In the meantime, we just placed a big order for our windows and doors, and have otherwise made all other decisions in flooring, cabinets, counters, tile, hardware, and plumbing. We are researching now for lighting fixtures and considering our options for woodwork and built ins. More to come on these details soon! Do you face the river? How close are you to the river? A two minute walk down the driveway and around the corner. How much land do you have and where is it? A little over half an acre, in city limits, near pony pasture rapids. A modestly-sized, environmentally sensitive, low-maintenance home that effortlessly integrates into its surroundings. Industrial and natural materials: glass, concrete, wood, metal. A comfortable—sometimes luxurious—technologically enhanced, light-filled spaced inspired by modern design that melds minimalistic architecture and natural family living in fascinating and surprising ways; a relaxing retreat that invites nature to come inside. 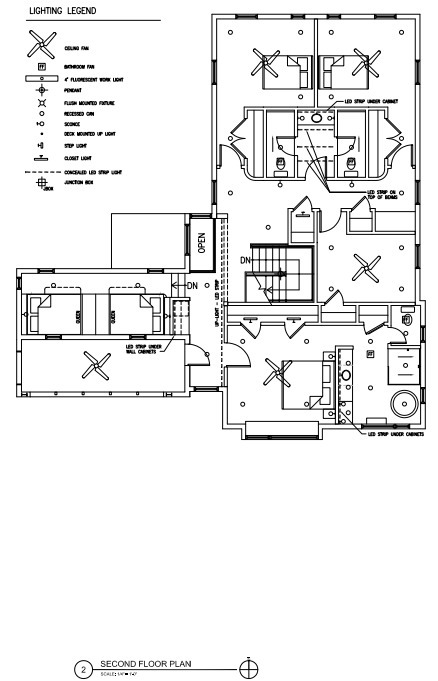 A floor plan that fosters intimate family interaction, and accommodates larger gatherings for entertaining. Spaces that serve a clear function and purpose. We hope to turn the land into a sanctuary for good, easy living that brings us in tune with the river, ourselves, and each other. How many square feet is the house? 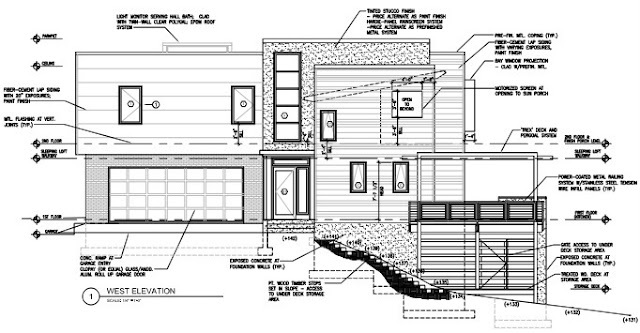 2700 square feet of living space and a 2 car garage. We are the builder! Andy is acting as the general contractor (GC). It means that he is responsible for managing the project, making sure it is built correctly and on budget, purchasing materials, coordinating all of the subcontractors and trades, as well as permitting and compliance. It's like a part time job he works on in the evenings after work, and it's one of the reasons we put everything on hold when Winslet was born, we just didn't have the resources to focus our attention there when we had so much happening at home. What are the benefits to acting as the GC? 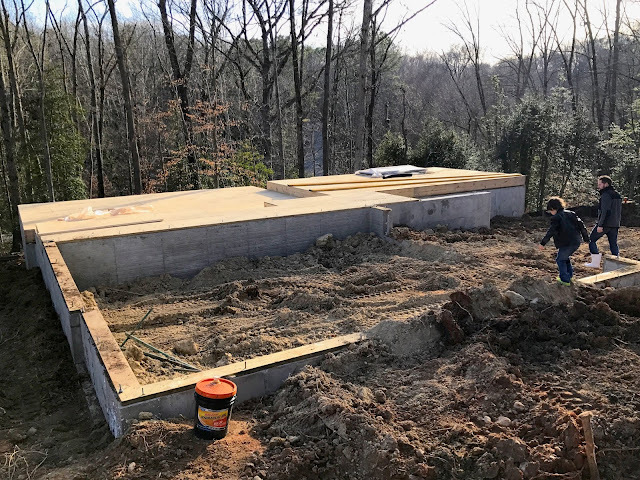 Building the house ourselves gives us very detailed control over every aspect of construction, for example, where a builder may simplify in order to keep their costs low and profit high, we can have done exactly as we wish. Also, the costs, overhead, and profit that a builder would include in the price of a new home we will gain as instant equity at the completion of the project. In May if all goes as planned, no later than August (worst case) because that's the term of our construction loan. Probably late May, early June. One benefit to having a project without a deadline, and in our case, one that we put on hold for the better part of a year due to the variables of my pregnancy with Winslet and then her early birth, is that we've had a lot of time to mull over every detail, to sit with particular ideas for weeks and even months, to dream up different ways of doing things, and discuss every option at length. Building a house like this, from scratch, is a big undertaking and the sheer number of important decisions that have had to be made in between tending to our little family during some really stressful times made it challenging for me to fully engage at any given moment. I'm thankful that we've had time on our side in that way, but it's hard to believe two years have passed since we first sat down to begin the design process. From the start we had a very concrete vision for how we wanted our home space to feel and for the functionality of each area, but we weren't too (too!) 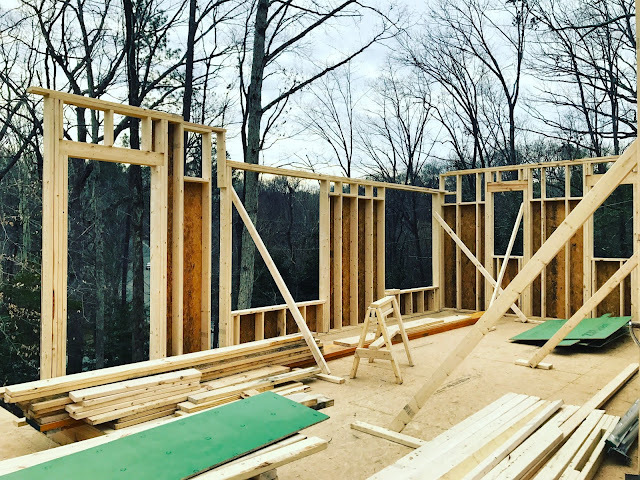 attached to specific architectural or interior design elements, so the emergence of the details of our home over time—each meeting and each decision making way for the next—has been such a fun and surprising experience. The final plans reflect a culmination of ideas and effort, and all the minor tweaks made by us and by our architectural team over all these months, including a very recent and last minute (big!) revision to give Winslet her own room, which I'm really glad we decided to do. It was a swap for what would have been an amazing laundry room, but I think this will suit everyone well as the kids grow up. 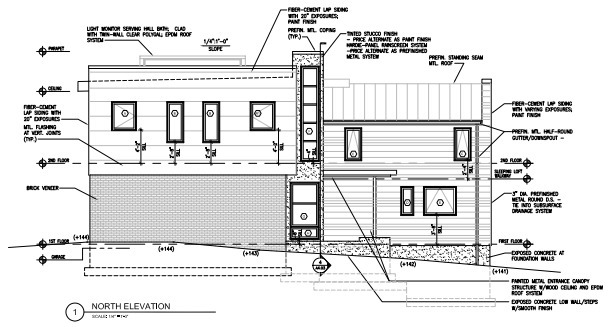 With that said, I'll just share here these updated exterior schematics and floor plans in part to keep the process documented, and also to reference as we move forward with some more detailed house posts. For some conceptual perspective, if it helps, the house is L shaped and is nestled on the top third of a steeply sloped corner lot.